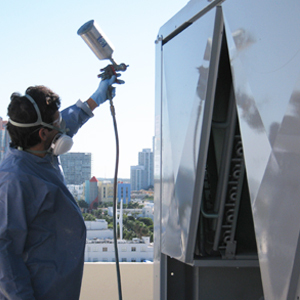 EGuard DCC Top Coat is an extremely durable, polyurethane clear-coat specifically developed to provide comprehensive corrosion protection for the outer casing of any HVAC/R unit. EGuard DCC Top Coat offers excellent protection against abrasion, moisture, corrosive fumes and chemical contacts in all types of environments. EGuard DCC Top Coat is an anti-microbial formula that resists dirt and dust adhesion, thereby reducing the presence of micro-organisms such as fungi, mildew, stain causing bacteria, and algae which can add to the corrosion process. EGuard DCC Top Coat will stand up to the harshest environments and deliver long lasting durability and the highest level of protection to keep your equipment looking and operating like new. Additionally, our polyurethane formula will not crack and chip over time like epoxy coatings. EGuard DCC Top Coat is suitable for OEM and ACE finishing applications and can be applied before assembly of the unit, before or during installation or even years after installation as part of our Rejuvenation Service. 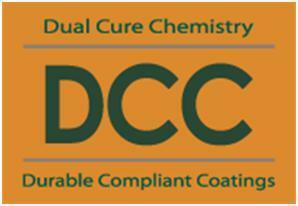 All EGuard coatings feature our proprietary Dual Cure Chemistry (DCC), a hybrid curing solution that cures fast without the need of heat or other catalyst and provides superior adhesion and excellent sealing properties. Dry to touch in just 15 minutes, EGuard DCC technology allows us to deliver the fastest turnaround times in the industry!